Jan. 8, 2019 – Harris County Sheriff’s Office homicide investigators have filed a capital murder charge against Larry D. Woodruffe, 24, and Eric Black Jr., 20, for the Dec. 30 shooting death of 7-year-old Jazmine Barnes. Jazmine’s mother was driving Jazmine and her three sisters southbound on the East Sam Houston Parkway feeder road near Wallisville Road at approximately 6:50 a.m. on Dec. 30 when they were fired upon by someone in another vehicle. Investigators identified Woodruffe, and Eric Black Jr. as suspects based on a tip. Subsequent investigation revealed evidence that corroborated the tip, and both men were taken into custody on Jan. 5 in East Harris County. Woodruffe was booked into the Harris County jail on a felony drug possession charge, pending further investigation. Black then admitted to taking part in the shooting and was charged with capital murder. ANA HERNANDEZ, State Representative for District 143, is shown at the first session of the 86th Legislature after her swearing-in ceremony. Pictured with Ana is Amir Khan and Debra Barrera Carrizal. 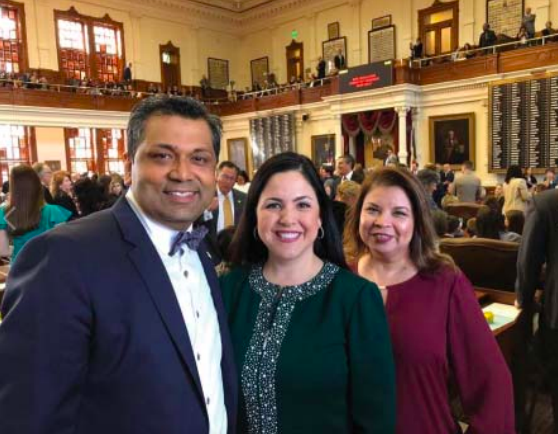 Austin, TX — Tuesday marked the beginning of the 86th session in the Texas Senate, a 140-day term in which state leadership has pledged to tackle the complex issues of public school finance reform and property tax reform. Governor Greg Abbott was on hand to welcome the members, new and current, and promised to finally resolve these issues. “We are going to step up and address it,” he said. Other major issues facing the Legislature this session include state pension funds and contracting oversight, but like Abbott, Senate leader Lt. Governor Dan Patrick and newly elected House Speaker Dennis Bonnen have highlighted property tax and school finance reform as critical issues this session. One of San Jacinto College buildings. PASADENA, Texas – A recent study has found that San Jacinto College had a $1.3 billion impact on the region’s economy in fiscal year 2016-17. The study, conducted by Economic Modeling Specialists International (EMSI), reported that the impacts created during the 2016-17 fiscal year are comprised of $143 million in added income from operations spending, $24.4 million from student spending, and another $1.1 billion from alumni. The College’s impact equals 2.4 percent of the regions gross regional product, and a total of 13,044 jobs. In return for their investment in the College, the present value of the higher future earnings that San Jac’s students will receive over their working careers is $1.6 billion. This amounts to a return of $6.30 in higher future earnings for every dollar that students invest in their education. The study also found that students receive a 19.8 percent annual return on their investment in a San Jacinto College education.